Caitlin M. Roop has been a Licensed Aesthetician in the state of Virginia since 2010 and is now recognized as a Licensed Master Aesthetician. She received her education from American Spirit Institute and comes to the Dermlounge with over seven years of experience in the Aesthetics industry. Caitlin began her career in the medical field in 2005 and soon discovered her true passion was skin care. Caitlin’s main interest is in medical skin care and aesthetics. She enjoys staying up to date and learning everything there is to know about the advancing aesthetic industry. 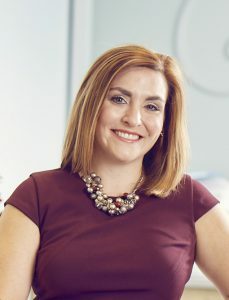 Caitlin takes true pride in her work and is passionate about helping people look and feel better, while addressing any of their skin care needs. She enjoys building relationships with her clients and really getting to know them. Caitlin grew up in Midlothian and currently resides in Downtown Richmond with her husband, David, and their two kitties. During her free time she enjoys shopping, traveling, listening to live music, and anything outdoors. To learn more about Caitlin and the rest of our team at Dermlounge, please contact us today to set up an appointment.